Do business leaders have to know it all and be it all? What’s the real secret to success? 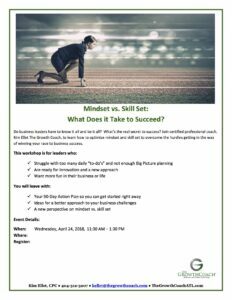 Join certified professional coach, Kim Ellet The Growth Coach, to learn how to optimize mindset and skill set to overcome the hurdles getting in the way of winning your race to business success. Help us plan for your attendance by registering HERE. You bring your lunch and we’ll supply chips and dessert.